He cares more about Extra Curriculars than the average student. The following is my objective evaluation of the quality of UCR as a university based on things I find important. I guess some people have different priorities (for instance, need to be near dirt and smog), so some of this won't apply. is composed of proofs, derivations, and non-straightforward problems. If that Berkeley exam were given at UCR, I guarantee that 90% of the class would turn in blank tests. In fact, rumor has it that a good portion of freshman engineering majors begin in PRE-calculus…honestly, I wouldn't be surprised if that were true. In freshman classes that I had AP's for in HS, I aced the exams without even showing up for lectures…this is not because I'm a superstar, it's because the standards of education and achievement are so low it's laughable. 2) Professors/TA's—no noble laureates, but in most major departments, the faculty are fairly accomplished in their fields. To be tenured at any UC school, you have to be quite successful in your field, and at UCR, there's no exception. HOWEVER, the TA's were horrendous. If you think about it, UCR is not exactly top quality when it comes go grad school…so if you're graduating college and you become a grad student at UCR, you must really have a lousy resume (or you smoked a lot of pot during undergrad). These people are your TA's, and they teach the discussion sections of your classes. Needless to say, if these individuals are teaching your discussions, you ain't gonna learn squat. 3) Reputation - This is actually very important. When applying to grad programs (esp medicine, dental, law, etc. ), they give a lot of consideration to the undergrad school you come from because it reflects on you as an applicant. Coming from UCR hurts you. All else being equal, would you want an applicant from UCR or a real school? Even in the job market…if you're looking to enter a competitive field, it's not exactly glamorous to have "UC Riverside" stamped across the top of your resume. The ONE exception is if you plan to work or go to grad school in or around Riverside county (excluding L.A.). The town is hickville and most of the folks there think anybody who goes to college (regardless of where) is an intellectual. Therefore, you are probably overqualified to work in Riverside county given that you hold a diploma from an accredited university, but that works for you. Otherwise, if you go travel outside a 50 mile vicinity of Riverside, you will find that many people have never ever heard of "a U.C. in Riverside????" They've heard of EVERY OTHER U.C. school EXCEPT Riverside. This is not an exaggeration. Take a peek at U.S. News to see just how low UCR ranks (which is loosely correlated with reputation)…and if you're into trends, UCR's rank has been dropping gradually each year for the past few years. 3) Students—the vast majority of the student body is composed of people living in the "Inland Empire," the area of desert California near Riverside. The high schools in the area are generally of similar low caliber. In the average graduating class of HS seniors, only a few go to 4-year schools, and going to UC Riverside is considered quite an accomplishment. These high schools only have a couple of AP classes, and I'm assuming that their test scores aren't so hot. This is the where a large portion of the UCR student body is derived from. The other big source is those students from all over the state who are rejected by every other U.C. and students go to UCR rather than go to a "Cal State" university. A common nickname for UCR is "U.C. Rejects." This is just one of the many jokes people have about UCR. In general, students at UCR are very unmotivated, don't work very hard, and don't have a very rigorous grasp of the material presented to them. In fact, a visiting professor from France was overheard exclaiming "Why do they come to university!!??" in frustration over how unmotivated the students were—apparently, in his home country, only intelligent and motivated students pursue education at the university level. Welcome to Riverside, professor. 4) Campus - I realize this is personal preference, but I've visited quite a few universities and honestly, I think UCR is one of the UGLIEST dumps I've ever had the misfortune of seeing. The buildings, for instance, have a very plain and uninteresting architecture, whereas at other U.C. 's, the structures are intricate, thoughtful, and pleasing to look at. 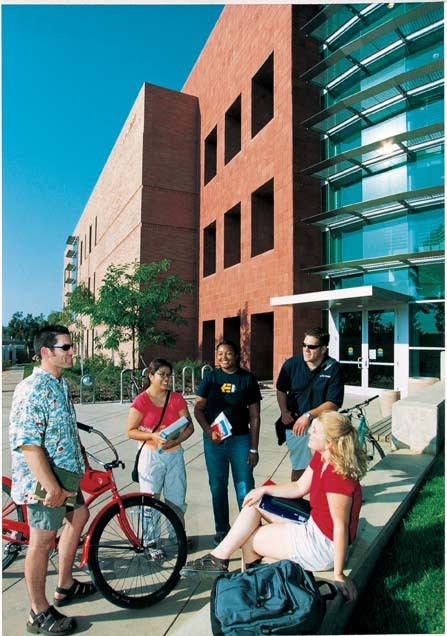 UCR's buildings look cheaply constructed at best. Just look at the belltower, situated in the center of campus…it consists of a very plain structure with a bunch of holes in the side. Ugly. Compare this to the belltower at UC Berkeley—night and day. Overall, the general campus feel is that of a large high school or a glorified community college. It does NOT feel like you're at a 4-year university, so if you were hoping to feel like you're in college, this ain't the place. On the other hand, if you loved high school so much that you wanted to go their for 8 years total, UCR is where it's at. 5) City - Riverside, as a city, is DEAD. There is absolutely no night life, no activities, no nothing. Everything closes early, you don't want to be walking around Riverside at night (at least not without a firearm), and there's really no good hang out spots. Recently, a neighboring outdoor strip mall was built and expanded (University Village) which provides SOME entertainment, but it's small and gets boring quickly. The nearest decent city is Los Angeles, about 1-1.5 hours each way. Otherwise, you're better off staying in your dorm playing checkers with 8 year olds on AOL. Bars? Yeah, if you like 40 year old divorced men and women wearing cowboy hats. Beach? Doesn't exist. Downtown? Yeah, it's 3-4 blocks and there's absolutely nothing. etc. etc. The only redeeming quality about the city is that housing is so cheap that it's not even funny. You can get newly built luxury apartments for an absolute bargain…you can get older, roach-infested apartments for an absolute steal! 6) The Weather - extremely HOT and SMOGGY. In a published report of air quality in California, Riverside county actually ranked worse than Los Angeles. The smog is so thick you can cut it with a knife. Smog creates an ugly brown blanket over the horizon and places a low-contrast haze over everything. The result is actually quite sedating and you feel like you're snowed when you walk around. The only nice thing about the smog is that you get very colorful sunsets…so if you're permanently attached to a respiratory ventilator and your air is pre-filtered, you might appreciate the nice sunsets. Oh, and the heat is unbearable. Being inland isolates the area from the ocean breeze, so temperatures can easily reach the 90's and 100's in the late spring to early fall. 7) The River - well at least Riverside has a beautiful river with trees, boats, and fresh water. Just kidding, there IS NO RIVER! It dried up a long time ago, so it's just a riverbed now. Talk about misleading…kind of like "Greenland" is mainly snow and ice. Bottom line - UCR is an absolute zero in every single department that I can think of. There are no major redeeming qualities that I can come up with other than the fact that it's not located in Afghanistan and …well..yeah, that's it. The education is subpar, the TA's are horrendous, the students are not-so-bright and unmotivated, the campus is fugly, the city is dead, the school reputation is poor, and the weather is obnoxious. Just to get a complete picture - Did you graduate within 4 years, apply to med school (accepted ? ),did you receive assistance, recommendation letters from your profs. A ton of understudies take a shot at Academic Success so it become progressively incredible for them. The depaulbookexchange offer who you can improve your instruction level effectively.